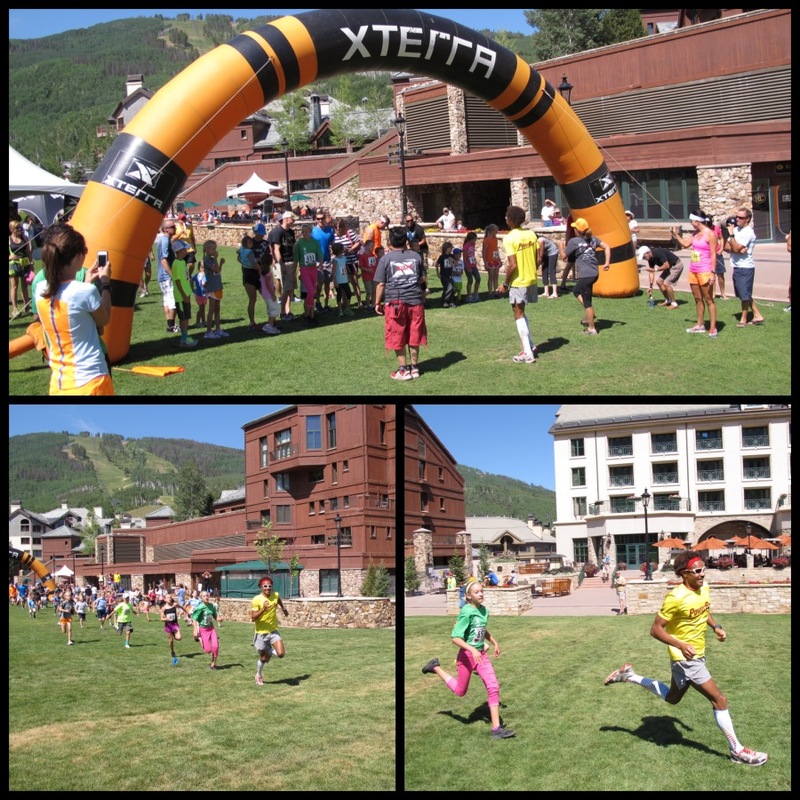 Well I'm happy to report that I survived this weekend's XTERRA Mountain Champs race at Beaver Creek Resort. After my previous entry, I was riding a bit of an optimistic HIGH. I had just completed my first hard workout in ages and it went well. Armed with that new found confidence, my wife & I headed UP into the mountains for a nice weekend in Avon, Colorado (just outside of Vail). We arrived at race headquarters by 1PM on Saturday, just in time to catch the awards ceremony for the Triathlon portion of the weekend's activities. The location was breathtaking, not only because of the elevation (over 8,000 feet) but the views and world class ski facilities. I gathered my race packet and greeted two of my favorite XTERRA personalities in President: Janet Clarke & race announcer extraordinaire Kalei Waiwaiole, whom I hadn't seen since the XTERRA Southeast Championships. After a quick stop by the PowerBar booth and a chat with good mate Richard Burgunder and I was ready to preview the course. I had been feeling a bit flat and tired since the workout on Tuesday, so I wanted to make sure I ran the hilly course nice and easy. I also wanted to make sure I knew the course inside & out in order to avoid any potential blunders come race day. Covering the course at ANY pace seemed both a literal and metaphoric uphill battle. My breathing was labored and my quads felt both exhausted and heavy. The first two miles were straight uphill consisting of switchbacks and single track. Despite feeling less than stellar during my course preview, I kept telling myself that, "no matter what you have to suffer through, others will too...". I've repeated this mantra many times during training, course previews and races. Sometimes you feel like you're the only one out there suffering and in those instances it's nice (albeit not an overly humanitarian wish to bestow on your fellow competitors) to know those behind you are going through the same hell you are. The course was beautiful and well marked. I didn't know who I'd be facing on Sunday, but that didn't matter. That's part of both the beauty and curse of XTERRA, you never know who's going to show up (at least in my case). Road runners, Trail gurus, Ultra Runners and/or Track Speedsters alike tend to converge at many of these XTERRA events. Young and old, everyone is welcomed to challenge themselves against nature and in this race's case the THIN CRISP ROCKY MOUNTAIN ELEVATION. We arrived at the race venue at 7:30AM, a solid 90 mins before the cannon would blast and send us into a frenzy. I'd had a great night sleep and hoped that the previous day's lethargy would be a thing of the past. Molly and I found a quiet place to sit and relax until I was ready to commence my pre-race routine. At around 8:15 I headed out for a 20-25 minute warm up. I decided to run the first mile of the course again, to see if it seemed as bad as the previous day. Unfortunately, it seemed slightly worse! I couldn't believe how much my breathing was labored despite how slowly I crested the inclines. I pushed the negative thoughts out of my head and just figured that once the race started I'd be fine. Normally the adrenaline and excitement of competition can transform one from a timid, nervous, pre-race jittered runner, to a battle ready beast right out of the movie 300. I've seen this remarkable metamorphosis many times in my years as a runner and have experienced it myself. So, naturally, I was planning on relying on that to jump start my body. The infamous XTERRA Cannon boomed sending a healthy fleet or runners sprinting of the line. I was somehow momentarily caught off guard and didn't react as quickly as I normally would. With the cannon still ringing in my ears and the smoke floating away, I took a few hard strides in order to position myself. I immediately found myself in 5th place behind Richard Burgunder, eventual winner: Jordan Chavez and the pint-size AND talented Welsch sisters, Kaytlynn and Heather. If you haven't heard of them before, Google will bring you up to date on this dynamic duo. Despite their youth, they're quite prolific and experienced runners and regulars on the XTERRA circuit. As I mentioned earlier, the first two miles or so were straight uphill and I definitely did not feel like Usain Bolting out of the gate. Despite my wish for a tamer pace, I chased down the early leaders in order to position myself before the course entered a long single track portion. Within a minute or two, three of us (Richard, Jordan & myself) had separated from the rest of the pack. Having never raced either Jordan or Richard before, I decided to stalk them and let them set the pace. Another minute or two later and Richard waved me on as he could feel me breathing down his neck. 1 down... 1 to go? Jordan and I immediately separated ourselves from Richard. By the time we hit the first mile, Jordan had built a solid but not insurmountable lead of about 10 - 15 seconds. I kept thinking/hoping that a couple of things would happen. 1) I would eventually snap out of my oxygen-deprived induced funk and (2) Jordan would "pop" (when a runner hits the wall, crumbles, becomes exhausted, bites off more than they can chew, etc, etc...) and I'd be able to pick up the pieces. This was not to be though, as Jordan ran an excellent race and went on to a convincing victory. Hats...I mean headband off to him, he ran his own race and was never truly challenged. Later, during our cool down together he did confess to feeling the hills/elevation and looking over his shoulder numerous times, hoping I wasn't reeling him in. He also mentioned that he'd been in the area training for the past 3 weeks. It made me think to where I was 3 weeks prior, and it certainly wasn't hitting the high altitude trails. Instead it was treadmill running in Connecticut in order to avoid a possible bear encounter. Either way, it was great to cool down with Jordan and learn how universal the fears and pains we suffer are. I, much like Jordan, spent the race alone. I finished a distant 2nd and was never really challenged for that position. Still, I never gave up hope on capturing 1st place and pushed each hill to the best of my abilities on that day. The downhills were a mix bag, as I would push as fast as I could go, but often times found that my lungs weren't keeping up with my legs, which was the case -albeit in reverse- during the uphill sections. Eventually I managed to end the suffering and crossed the finish line, where I was greeted by my wife, the spectators and of course the wonderful XTERRA crew. I congratulated Jordan, his family and then invited him to join me on a cool down. During our cool down, we introduced ourselves, talked a bit about our past and where we'd be racing next. That's definitely one of the perks of distance running, the comradery amongst competitors. XTERRA once again proved a great catalyst for that. We ended our cool down, congratulated each other and parted ways until the awards ceremony. Not one to stand around, sulk and lick my wounds, I quickly did a mental check list of the positives I could take away from the day's race. Yes, I'd come in 2nd (when I wanted nothing but 1st! ), yes I'd been soundly beaten and yes I had struggled on the hills, but all that negativity was quickly put away when I once again realized where I was not only two months ago, but a mere 3 weeks prior. It hadn't been till about 3-4 weeks ago that I was able to resume what I would call "proper training" and even then I hadn't been able to reach full volume (I'm still building my mileage). I remembered back to an evening in Alabama where the Marine Doctor at Fort Whitting had done a check up after my last race and even offered me crutches. I'd come a long way since then and knew/know the best is yet to come. So overall I had run as well as I could've on the day and walked away unscathed and all the better for it. Shortly after my cool down, I was approached by one of the XTERRA crew members and asked if I'd be interested in leading the Kid's run. "OF COURSE!" I exclaimed! I was given some quick instructions as to what to do and expect. My overwhelming fatigue and soreness quickly melted away as I saw the beaming smiles and excitement radiating from my worthy "Kid" adversaries. One by one they lined up, some timidly with the urging of their parents, while others with their cheeks and chest puffed out in an exuberant display of bravado. It was truly a great scene at the starting line and I couldn't help but smile ear to ear. Kalei gave the final instructions before the count down would send the mini XTERRA-thletes on their way. We took off and immediately sprinted towards a sharp right turn. I did my best to sprint and avoid a stampede! The Kids were full of energy after spending most of the morning watching their folks compete and weren't concerned about pacing themselves for the approximately 400 meter course laid out. Having successfully lead the winner to the finish line, I decided to camp out there and cheer on the rest of the finishers. It was a great way to close out a successful weekend for the XTERRA crew, competitors, parents and most importantly the kids, or "Future XTERRA-thletes" as I like to call them. Well that closes the book on another great experience with the XTERRA family on my road towards the National & World Championships. Now that I'm healthy, I fully intend to knuckle down and add some much needed consistent training in preparation for September - November's Championship racing.